weighed 110,000 lbs, and had a range of 1750-2300 miles. It was operational from 1958-1963 with 60 missiles based in England. The engine had a thrust of 150,000 lbs and burned LOX and RP-1. In 1957 and 1958, only 6 out of 18 launches were successful, mostly due to turbopump problems. A total of 224 were built. It was later developed into the Delta family of rockets. 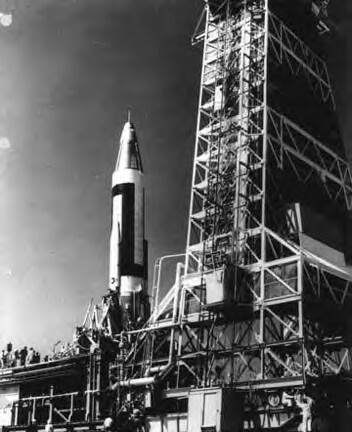 March 1: First test flight of the Army-Navy Jupiter IRBM. Weight was 108,000 lbs, thrust was 150,000 lbs and range was 1500 miles. It burned LOX and RP-1. 46 test launches were conducted. 22 out of the first 29 test and development launches were successful. It was operational in Italy and Turkey from 1958-1963, 45 vehicles in three squadrons. It was further developed into the 4-stage Juno II launch vehicle, used in ten launches. March 10: Scientists at NASA Lewis began conducting ion engine research. April 19: A second Thor test launch was attempted, but was destroyed by range safety after deviating off course. April: von Braun advocated building a Juno V rocket centered around four E-1 engines (combined thrust of 1.5 million pounds). This would eventually become the Saturn I. May 1: Vanguard Test Vehicle (TV-l), a modified Martin Viking (No. 14) first stage, with a Grand Central rocket for the second stage (destined to become the third stage on the final Vanguard) successfully launched an instrumented nose cone to 121.2 miles altitude at Cape Canaveral. May 15: First test flight of the Soviet R-7 ICBM at Baikonur. One of the strap-on boosters separated at 98 secs. causing the vehicle to break up. For R-7 specification details, see 8/2/57. 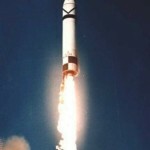 May 22: A third test of the Thor missile at Cape Canaveral ended in failure. 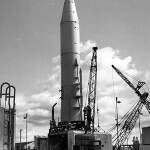 May 31: The first successful IRBM was fired 1,500 miles reaching between 250 and 300 miles above the Earth, at Cape Canaveral. Manhigh II to 101,516 ft (Maj. David Simons) on August 19,1957. Manhigh III to 98,097 ft (Lt. Clifton McClure) on October 8,1958. 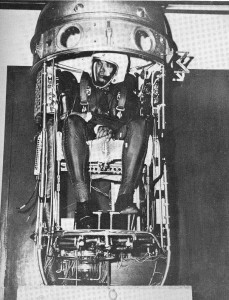 High Dive used manequins and had established that a drogue chute was necessary to prevent a flat spin of 200 rpm during free fall. Excelsior I to 76,400 ft (parachute jump by Capt. Joseph Kittinger II) on November 16, 1959. Kittinger was unconscious during the descent due to drogue parachute malfunction, but was saved by the automatic opening of his parachute. Excelsior II to 74,700 ft (parachute jump by Capt. Joseph Kittinger II) on December 11, 1959. Excelsior III to 102,800 ft (parachute jump by Capt. Joseph Kittinger II) on August 16, 1960. Record setting altitude and terminal velocity speed (614 mph) until Red Bull Stratos jump by Felix Baumgartner on October 14, 2012 (altitude of 123,491 ft and velocity of 843.6 mph or Mach 1.25). Capt. Kittinger lost pressure in his right glove and suffered severe swelling of his hand due to ebullism. 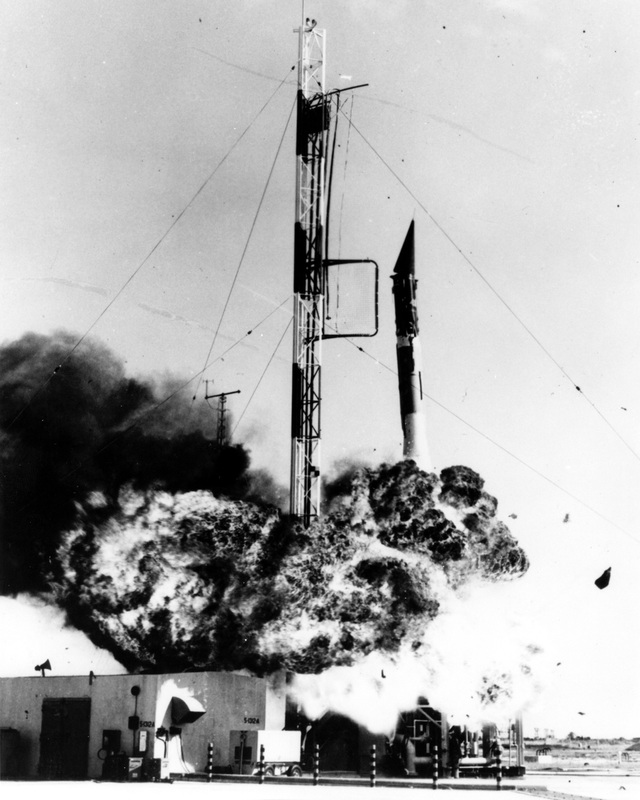 June 11: The first launching attempt was made of an Atlas A missile at Cape Canaveral, but it exploded shortly after takeoff, at 10,000 feet altitude after performing several loops. The Atlas A weighed 180,000 lbs, had a thrust of 300,000 lbs and a range of 350 miles. 5 out of 8 launches failed (the last launch was on 6/3/58). The Atlas A only had the two first stage engines and no center sustainer engine. The final version of the operational Atlas ICBM (D, E, F) weighed 255,000 lbs and had a range of 11,300 – 11, 500 miles. 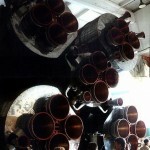 The three first stage engines had a thrust of 360,000 lbs and burned LOX, RP-1. 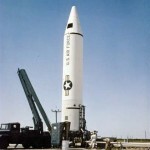 It was operational from 1959-1965 and at one time (1964) totaled a force of 118 missiles in the US. It began as the Convair MX-774 project in 1946. It was later developed into the Atlas family of rockets. 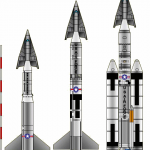 July 11: The North American Navaho ramjet intercontinental missile project was cancelled by the Air Force. 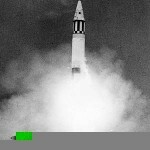 July 12: The second test flight of the Soviet R-7 ICBM at Baikonur failed due to loss of stability 33 secs after launch. August 7: An Army Jupiter IRBM carried a scale model nose cone 1200 miles and to an altitude of 600 miles from Cape Canaveral. The ablation-type cone was recovered. August 21: First successful test flight of the Soviet R-7 ICBM at Baikonur which impacted 6000 km downrange. The R-7 weighed 560,000 lbs and had a thrust of 810,000 lbs. with four RD-107 engines and a center RD-180 engine (both developed by Glushko) that burned LOX and RP-1. Range was 8000 km (12,000 km with the R-7A). 18 of 27 developmental test flights were successful (the last one in 2/27/61). It became operational on 2/9/59 with only 10 missiles at six launch sites in Baikonur and Plesetsk from 1959-1968. 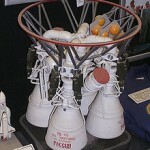 It was developed into the main booster for most Soviet space launchers, including Sputnik, Vostok, Voskhod, and Soyuz. August 26: The Soviet Union announced to the public the successful flight of an ICBM. August 28: The 14th U-2 flight over the Soviet Union flew over Baikonur and photographed the R-7 launch site. August: A fourth Thor missile was launched at Cape Canaveral, but exploded after 96 seconds. September 7: A second successful test flight of the R-7 at Baikonur. 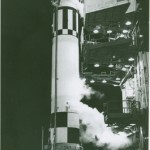 September 20: A fifth Thor missile was launched, and made the first successful flight down range from Cape Canaveral. September: The second Atlas was destroyed in a launching attempt at Cape Canaveral. 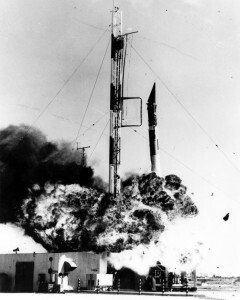 October 3: Sixth attempted Thor launch ended in failure. 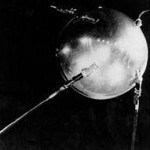 October 4: The Soviet Union launched the first Earth satellite, Sputnik I. 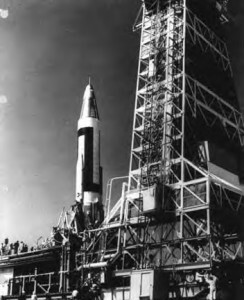 The launch vehicle was based upon the R-7 ICBM. Spherical in shape, it weighed 184 pounds and was 22.8 inches in diameter. The satellite’s initial perigee was 142 miles, its apogee 588 miles, and its period 96.17 minutes. 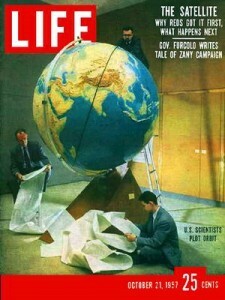 It was launched with an inclination to the Equator of 64.3’.The satellite reentered the atmosphere on January 4, 1958. October 11: The seventh Thor made a successful flight of 1100 miles from Cape Canaveral. October 23: A Vanguard first stage was fired at Cape Canaveral to climb to 109 miles, and fell in the ocean 328 miles off the coast in a successful test. Externally, it was structurally like the final Vanguard with inert second and third stages. It reached a speed of 4,250 miles per hour. 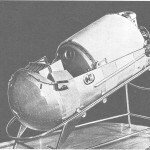 This rocket was labeled TV-2. October 24: A completely successful launching of the Thor missile was carried out on Cape Canaveral, the third such in eight attempts. October 24: Project Dyna-Soar (X-20) was initiated by the USAF for research, reconnaissance and strategic bombing. The objective of DynaSoar 1 would be to show that boost glide weapon systems could be made and to gather design data for DynaSoar 2, a family of weapon systems. These DynaSoar 2 weapons would be able to bomb or photograph a target 5,000 to 6,000 miles away, manned or unmanned. The ultimate objective of the program was DynaSoar 3, a recoverable bomber/reconnaissance plane able to reach anywhere on Earth. After further design development, it was planned that the launch vehicle would be a Titan III. October 31: A Snark missile was flown 5,000 miles with a simulated thermonuclear warhead to hit its target with unprecedented accuracy. The launching was from Cape Canaveral and the target was in the vicinity of Ascension Island. 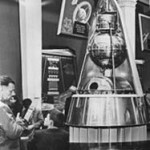 October: About 20 engineers at McDonnell began working on a manned orbiter design as part of the U.S. Air Force’s Manned Ballistic Rocket Research System program. By June 1958, as many as 70 McDonnell employees were working on the project. 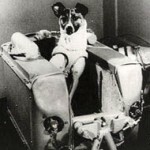 November 3: Sputnik II, carrying a dog, Laika, was launched by the Soviet Union. The perigee was 140 miles, its apogee 1,038 miles, and its period 103.75 minutes. Its inclination to the Equator when launched was 65.4’. The satellite reentered the atmosphere and presumably disintegrated on April 13, 1958. 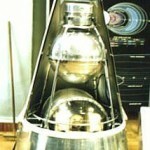 Laika expired after several hours (fourth orbit) due to cabin overheating and there was no recovery capability. capsule. This concept was considered to be the quickest and safest approach for initial manned flights into orbit. December 5: An announcement was made that an Advanced Research Projects Agency would be created in the Department of Defense to direct its space projects. 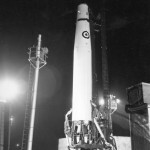 December 6: A mechanical failure in the propulsion system of the Vanguard rocket, TV3, caused it to burst into flames at LC18A two seconds after it was fired in an attempt by the Navy to launch a 6.4 inch, 3.25 pound test satellite. It was viewed live on public TV and drew extensive negative publicity world-wide. 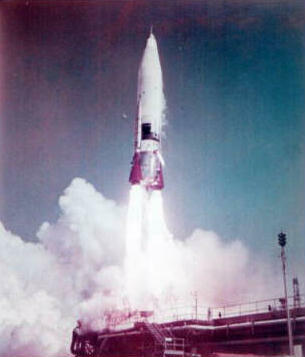 December 7: The ninth Thor was launched at Cape Canaveral at too high an angle trajectory when the guidance system malfunctioned. 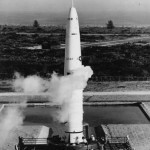 December 17: The fist successful flight was made by the third Atlas missile at Cape Canaveral over a range of 600 miles. December 19: The tenth Thor missile, and the fourth success, used an all-inertial guidance system, the first such flight. 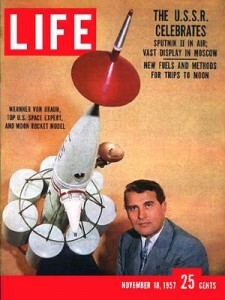 December 30: Wernher von Braun proposed the future Saturn launch vehicle with a thrust of 1.5 million pounds. At this time it was called “Super Jupiter”. 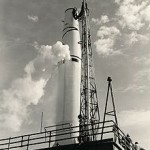 During 1957: The NACA Lewis Laboratory experimentally operated a 20,000 pound thrust hydrogen-oxygen rocket engine, leading to the development of the Centaur vehicle. 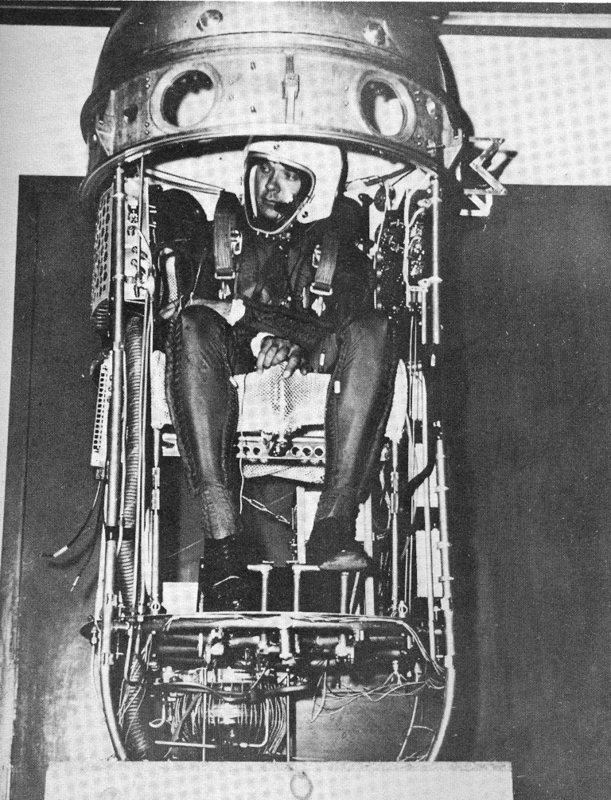 Roxburgh, H L, Ernsting, J. Physiology of pressure suits. Schack, G J D, Simons, D G. Technique for instrumenting sub-gravity flights. Beyer, D H, Sells, S B. Selection and training of personnel for space flight. Schaefer, HJ. Cosmic Ray Dosage during the Giant Solar Flare of February 26, 1956. 28040387-1.pdf JAM 1957 28: 387-396. Reflex) in the Cat during Weightlessness. Experienced by Pilots at High Altitude. JAM 1957 28: 121-126. – Campbell, P. Introduction. JAM 1957 28: 479-512. – Haber, H. The Astrophysicist’s Views JAM 1957 28: 487-492. – Crossfield, AS. A Test Pilot’s Viewpoint. JAM 1957 28: 492-495. – Hoover, G W. Instrumentation for space flight. JAM 1957 28: 495-498. – Mayo, A.M. Some survival aspects of space travel. JAM 1957 28: 498-503. – Strughold, H. Possibilities of an inhabitable extraterrestrial environment reachable from the earth. JAM 1957 28: 507-512.